Adding French Country style to a new home or a fixer-upper is easier to do than adding French Country style to an existing home. When you build a new house, you can include architectural details with French roots from the ground up. Fixer upper projects often include major renovations for floors, windows, room layouts, plumbing, appliances, and/or built-in cabinets. All offer ways to include French style. 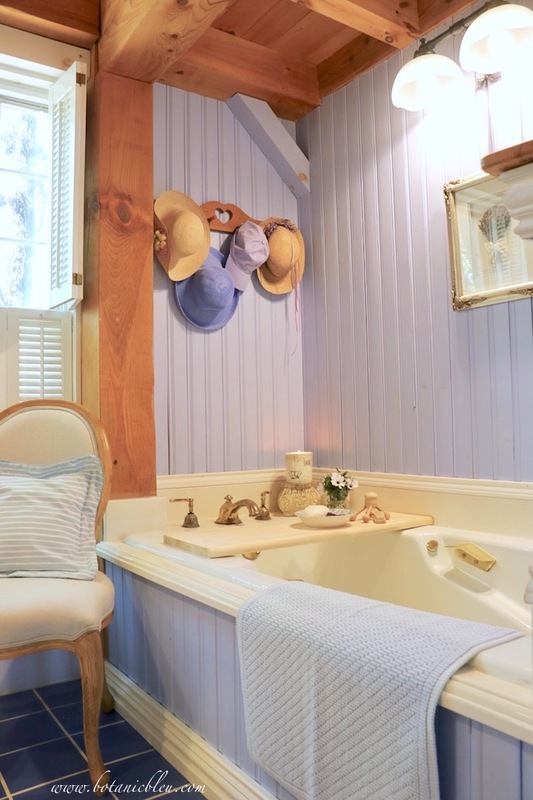 But, what about when you want to add French Country style to an existing room without remodeling? The good news is you can make changes to your rooms that will give them French style without changing the structures. With a little practice for looking at your existing rooms from a fresh perspective, you will begin to see changes you can make. Each new change will spark ideas for more changes. 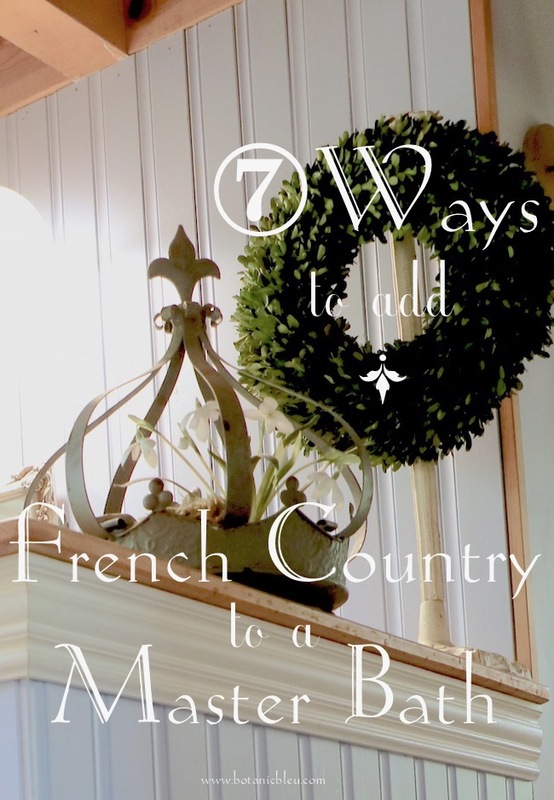 To get your creative decorating ideas flowing, take a look at seven ways you can add French Country style to a master bathroom... without making structural changes. 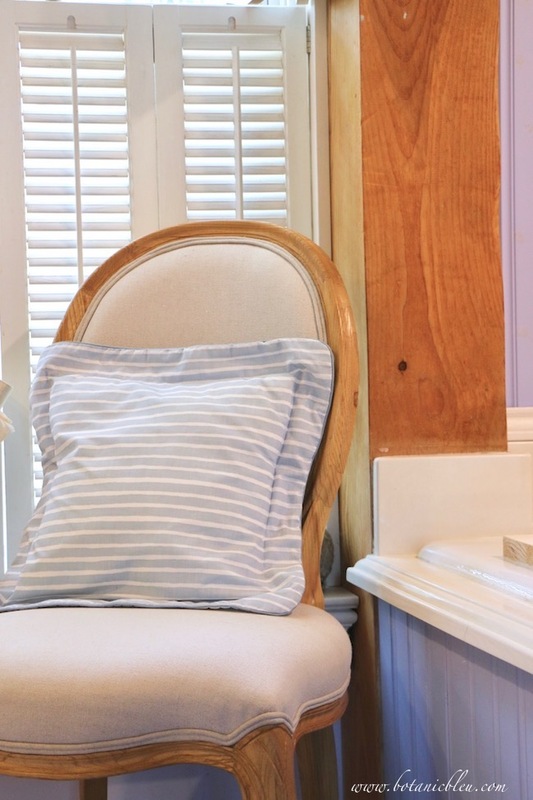 A French Country style chair instantly adds French flair to any room. When a room is small, and there is only one chair in the room, that one chair makes a big impact in setting the look of the room. Since there are no other chairs around, there are no conflicting styles. One chair takes center stage. There are several styles for French chairs, but for a French Country look, choose a chair that is simple in design. One without elaborate carvings, without a polished, reflective finish, and without delicate fabrics such as silk and brocade. More elaborate carvings in country style chairs are offset with other features. Painted wood instead of stained finishes, woven rush seats, or cane backs keep elaborate carvings from looking formal. Chairs with a rounded back, curved wood on the seat, and curved legs are classic French style. Sturdy, neutral colored linen upholstery has long been used in France and will look in style for years. The light wood stain has a country look that goes well with reclaimed, rustic pine. Carved wooden pedestals add architectural interest to existing rooms. New houses and remodeled houses can have French architectural elements added, but to get similar French style in existing houses, use new distressed pedestals, reclaimed rustic shutters, or reproduction columns. French script can be vintage French ephemera (old letters, documents, maps... ) or reproduction French script on bottles, candles, or fabric. Faded, worn images add a country look whereas crisp, sharp images add a more formal look. One of the hallmark features of French style is using inherited pieces that have been in the family for generations. 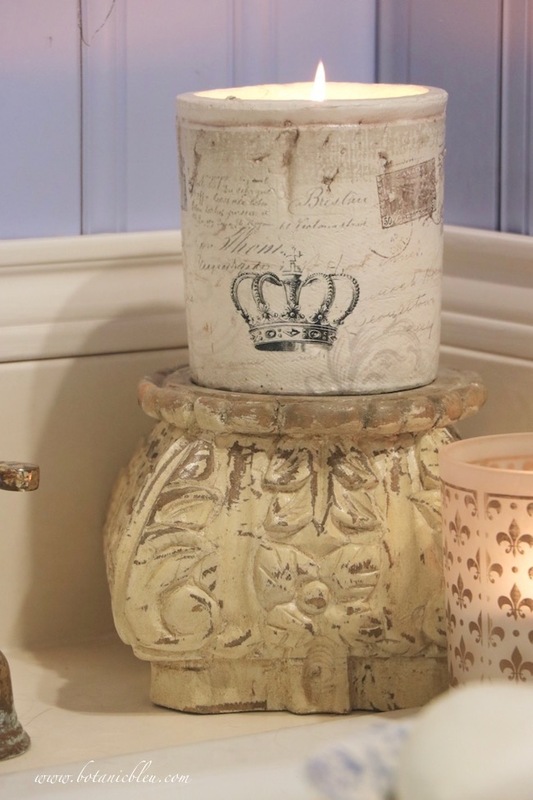 Choose faded and worn like the candle and pedestal above to give your rooms a gentle French Country feeling. 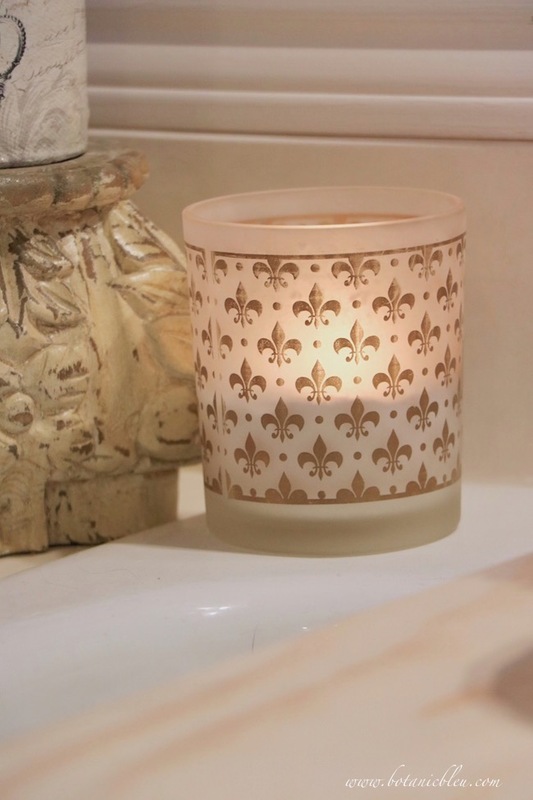 French symbols including the most recognizable one, a fleur de lis, create instant French style. Authentic French written language script or a fleur de lis are more natural French decor than objects printed with the words Paris or France. Does this mean Paris or France cannot be used as French Country style? No. Context and personal preferences, not rules or another person's preferences, always determine what you use in your home. Crowns are easily recognizable as French symbols due to the thousands of years of French royalty. Gray zinc metal crowns or distressed crowns are more French Country style than shiny gold or silver crowns. A spring arrangement in a crown is just one way to decorate with crowns. Crowns are excellent candle holders for large pillar candles. At Christmas, crowns can display a collection of Christmas ornaments. 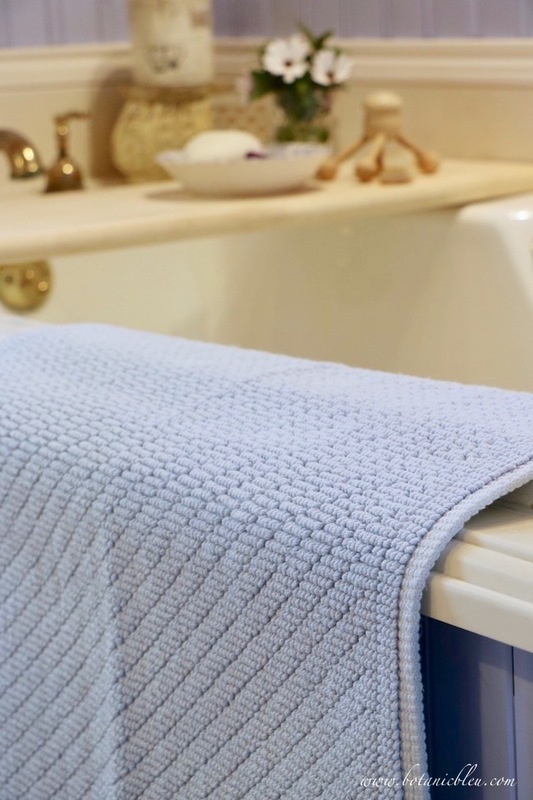 In a bathroom, a crown can hold extra rolled hand towels by the sink or hold extra toilet tissue on the back of the toilet. Yet, straw hats remind us of France. Monet, Renoir, Cassat... paintings depicting children, women, and men wearing straw hats come to mind. Damask, jacquard, linen tablecloths, linen sheets, and embroidered napkins spring to mind when the phrase French linens is used. Linen, silk, and cotton are the fibers of French linens. Natural fibers, not man-made fibers, are used to make the finest linens in France. 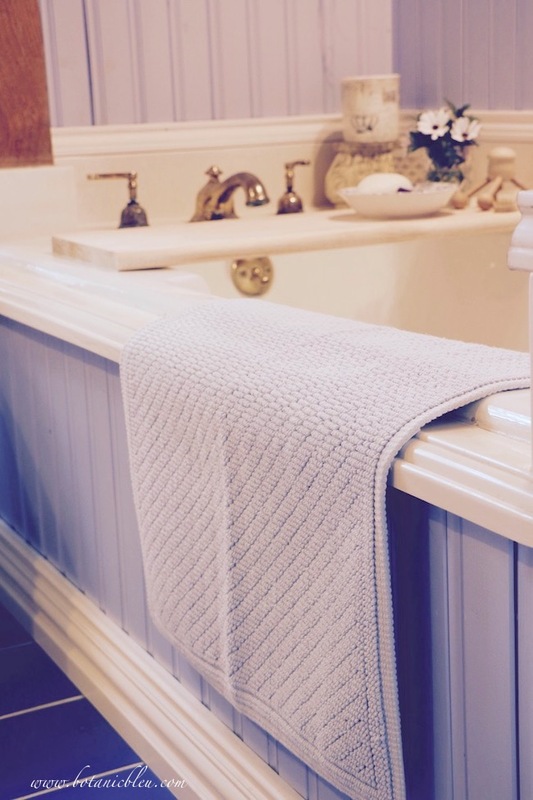 Adding a 100% cotton bath mat to a master bathroom is a way to add French Country style without breaking the budget. While antique French linens from Paris flea markets are the dreams of many homemakers recreating French Country in their homes, you do not have to have antique linens to create French Country style. Natural cotton is inexpensive and readily available. 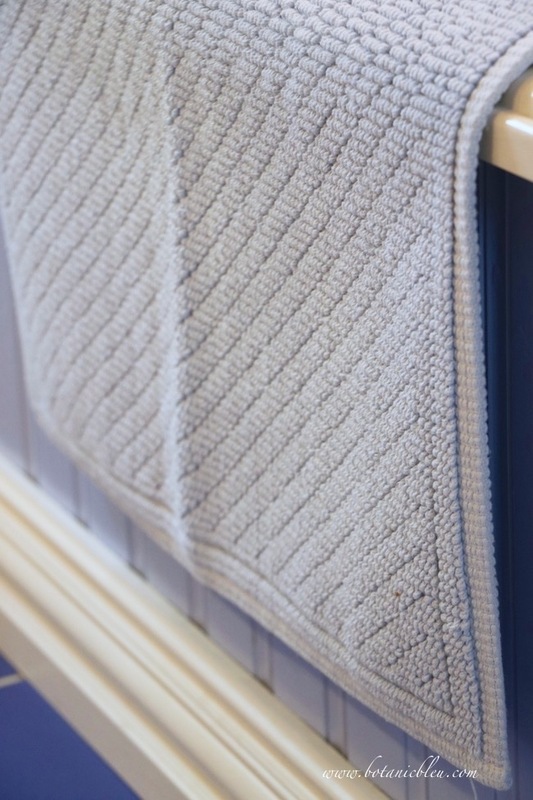 The detail in this textured cotton bath mat belies its modest price (less than $20.) Found at Target, the mat comes in several colors along with coordinating towels and bath cloths. A pale blue gray works well in this master bathroom, but white is a timeless choice for any color scheme. Neutrals, white, grey, black, creme, beige, are popular now. They have been popular in the past in France, also. Most brocantes (second hand markets) offer antique sheets, tablecloths, napkins, and kitchen towels in white or natural. 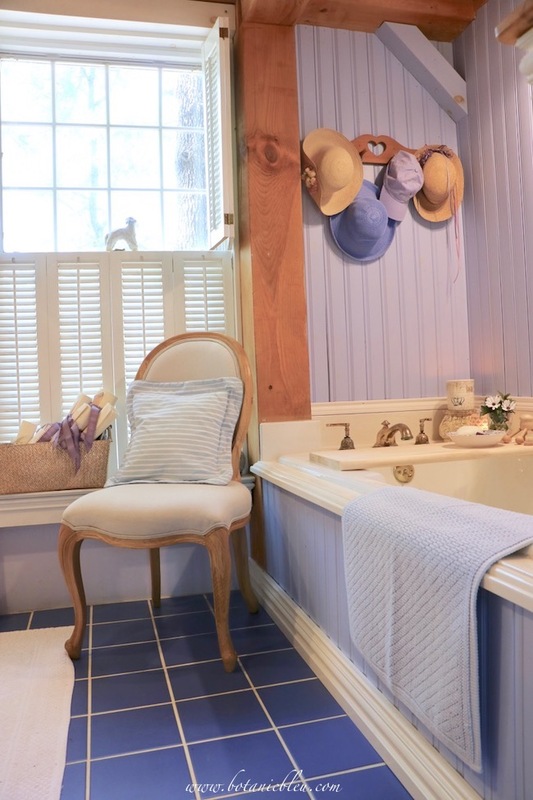 But if you want a color to add French Country style, French bleu is one for the ages. The name itself says French. 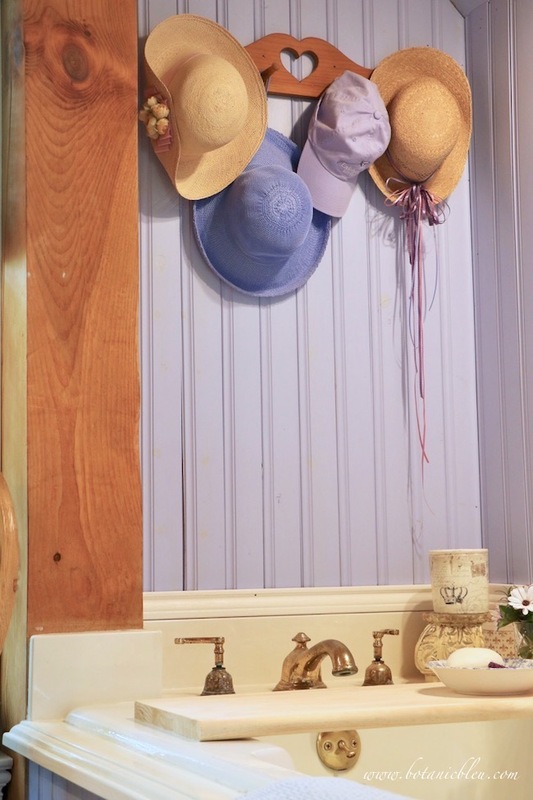 For a more country look, use a soft faded bleu instead of a vibrant bleu. True, vibrant bleu and yellow are one of the most recognizable color combinations in the Provence area of France, but a soft, faded bleu works well with the rubbed worn patina of French Country furniture. 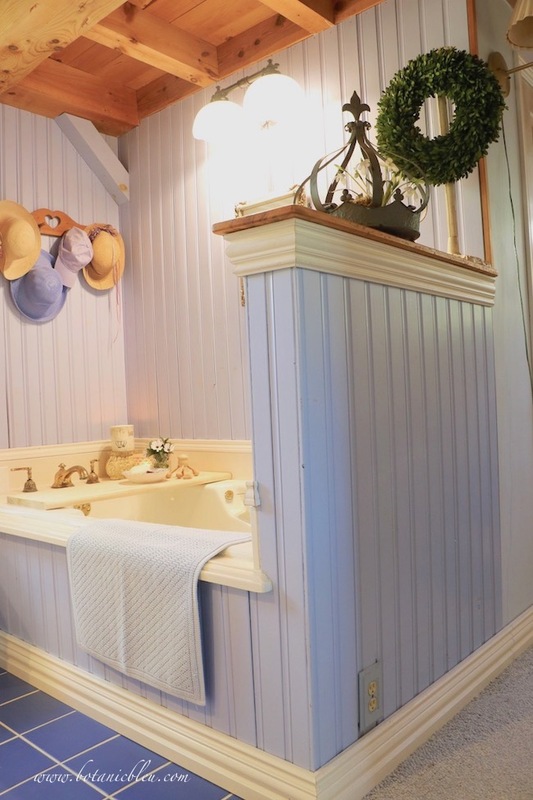 We are in the midst of refreshing our master bathroom with small changes. Painting the walls and woodwork are scheduled for two weeks from now, and we will use a softer, lighter shade of the bleu shown. The sheetrock walls are already a soft, pale bleu, and the bead board will be painted in the same shade of bleu. expensive remodeling and structural changes. Would you like to add a quick, easy, and romantic DIY wood tray to your bathtub? 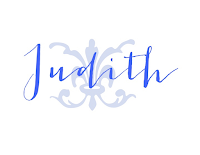 Watch for an upcoming post that shows how I created a DIY wood tray for my bathtub. No carpenter skills needed! For more ideas of how to add French design to your home, read my popular French Design on Friday series. Each post identifies French design, shows photos taken in France of that design, and then shows ways to incorporate that design into our homes. Enter French Design into Search This Blog found on the upper right top of the sidebar. There are 27 posts for French Design on Friday. Happy reading for French inspiration. 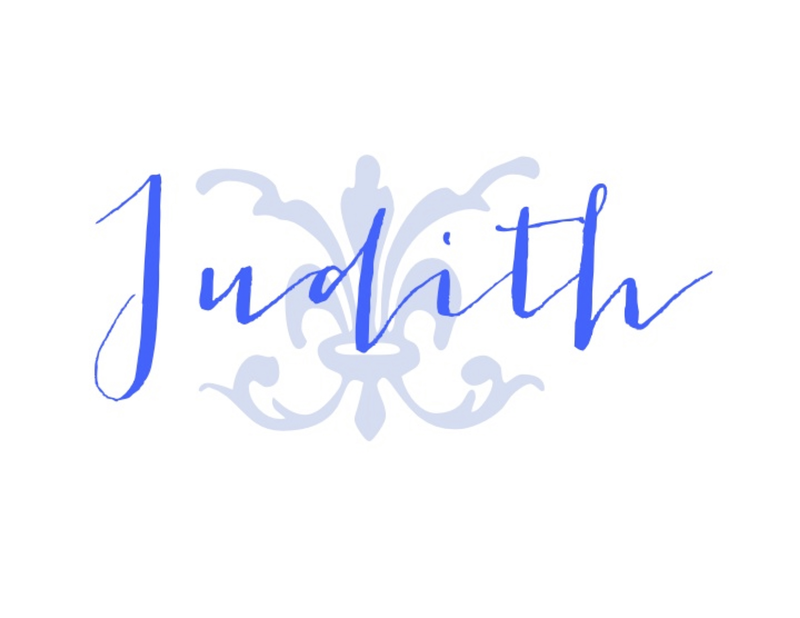 Beautiful bath, Judith! I always enjoy your ideas and excellent photos on your French series. Hope you are enjoying spring! Great ideas! Love the chair and the crown. Such great tips! I’m already stealing a crown from my porch for my bath! I love the chair. So cute.